WHAT DRIVES THE PRICE OF A SQUARE FOOT? Over the past five years, the median price per square foot has increased in each of the 50 largest new-home markets in the country, according to Hanley Wood’s research arm, Metrostudy. Housing’s recovery from the Great Recession is undeniably a factor in the increase of median price per square foot from 2012 to 2017, and the typical factors influencing that number—regulatory costs, the cost and supply of developable land, material costs, and labor—also play a role. 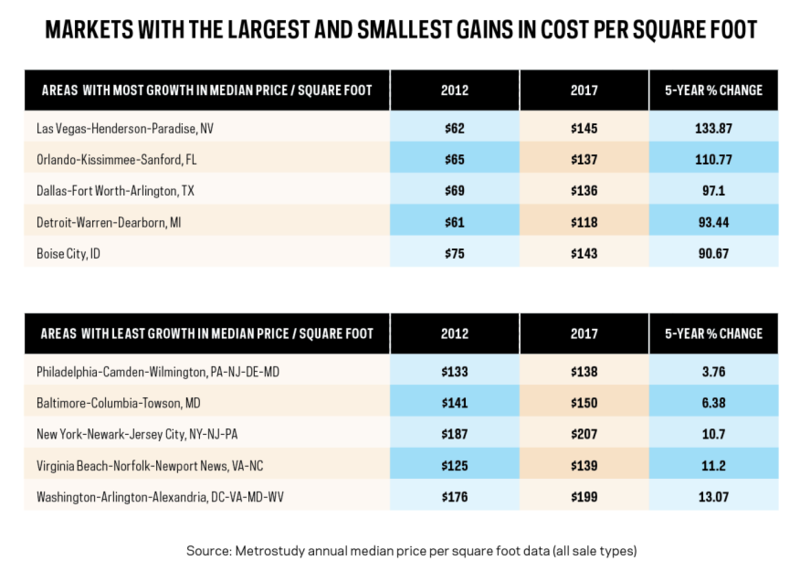 However, according to experts in some markets that have experienced the greatest and least degrees of growth in price per square foot, there are other factors influencing square foot price that are unique to their respective markets. The five markets that posted the largest gains in median price per square foot from 2012 to 2017 were well-distributed across the U.S. The Las Vegas area led the nation’s largest new-home markets with a 133.87% increase in price per square foot, followed by the Orlando area (up 110.8%), Dallas (up 97.1%), Detroit (up 93.4%), and the Boise City market (up 90.7%). The gains seen in Las Vegas and Orlando are fairly straightforward, as both were among the hardest hit markets in the country during the housing crash. According to Ryan Brault, Metrostudy’s regional director in Las Vegas, the median home price in the market dropped almost 50% from the peak until the market reached bottom around 2012. A major contributor to Las Vegas’ recent increase is that the market has been recovering for only the past five years—most markets hit bottom in 2011, while Las Vegas bottomed out later in 2012.